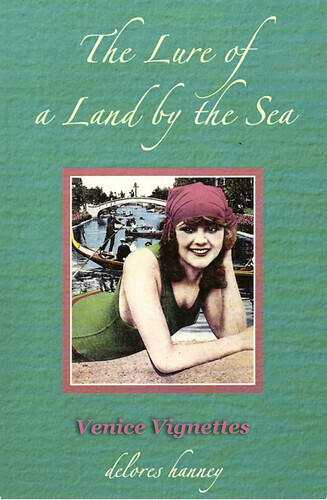 Delores Hanney: The Lure of a Land by the Sea: Venice Vignettes - Yo! Venice! “Venice, California sits here, at the far left side of the continent, the spot just before one falls off the edge.” With these words Delores Hanney launches into her brief, breezy histories about this town, famed chiefly for its high oddball factor that renders it a popular Southern California attraction second only to Disneyland at drawing visitors in vast swarms. The face Venice turns to the dawning sunlight each day has been mutating since the beginning, when Abbot Kinney’s dream community of class and culture was reorganized into something less lofty. As diverse as a rhinoceros from a Ruben sandwich or a rainbow, the stars that flitted across its stage have included – in addition to Kinney – tiger-tamer Mabel Stark, evangelist Aimee Semple McPherson, writer Ray Bradbury, race car guy Carroll Shelby and Irwin M. Fletcher (better known as Fletch). There are stories about all of them, and many others too, in The Lure of a Land by the Sea. Hanney brings to her historytellings the zeal of an old-time California gold miner; indeed, her narratives shine like little gold nuggets gathered up together in a swell sprightly style. The book also includes a golden foreword in the form of a jaunty Venice memory piece written by William Carroll.